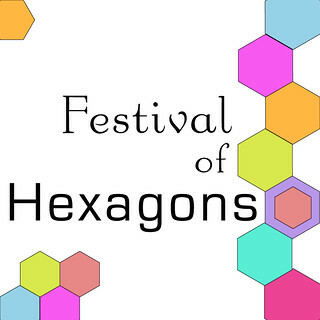 A few months back I mentioned the Festival of Hexagons (a follow up to Megan's Festival of Half Square Triangles). Summer is flying by and the Festival is almost upon us. Starting August 13 (less than a month away! ), some of the coolest sewing bloggers will be posting hexagon projects and tutorials for you. I've seen a few sneak peeks of their projects and am thrilled with their endless creativity. We have 2 weeks of tutorials lined up, followed by a linky party for you to share YOUR creations. Our fabulous blogger will select the 10 finalists, then you will be able to vote for the winners! Fat Quater Shop has generously offered to sponsor the prizes. Ali from a²(w) <-- that's me! I've started a Flickr group so that you can share your creations with us! I can't wait to be inspired by your hexagons! I'm super excited to see your hexie projects!! I've been working on mine since last October ~ have fun!! Do the entries have to be finished projects or can I enter my block design? That's what happens when you post things at midnight. I just discovered the festival! So much beauty to see already. I just love hexagons! Looking for the information on the Link Party. I've got a couple of projects to post!